If any aromatic could lay claim to the title of signature herb when it comes to Italian food, then surely basil must be the odds-on favourite. There is something about its warm, sweet nature that even in the grip of a fierce northern European winter can transport you back to those long, lazy summer days in the Mediterranean. These quasi magical properties also extend to palate, where the addition of basil can leave the diner spellbound. Basil prominently features in two of the Bel Paese’s most famous inventions, insalata tricolore and pesto. In both recipes, the leaf is used in its raw state, providing the more dominant flavour in the finished article. The tricolore refers to the three colours of the Italian flag that make up the salad: the red of the tomatoes, the white of the creamy mozzarella, and the vibrant green, represented by the basil. The success or failure of the dish rests solely on the quality of the individual products, so it is worth taking a little time to shop with quality at the top of your list of priorities. The same philosophy should apply to the olive oil used to dress the finished salad. Pesto, the essence of the Ligurian region from which it originates, can be found in a wide variety of commercially produced packaging on supermarket shelves the world over, but given the simplicity of the method, it is rewarding to take the trouble of making your own. The recipe for pesto, along with the one for the insalata tricolore, can be found in the famous recipes section of this site. Another famous offering that features basil is the pride of the Neapolitan kitchen, the pizza margherita. Naples is also the home of puttanesca sauce, a fierce tomato-based accompaniment to spaghetti or penne that is proof that basil can fight its corner, even when confronted by a fellow ingredient as formidable as chilli. Along with the ubiquitous plum tomatoes, garlic, olives and capers are the other components in a culinary invention that reflects the fiery reputation of the southern seaport from which it originates. Indeed, introduce a little too much heat and you may be forgiven for thinking your tongue is experiencing the molten outpourings of nearby Vesuvius itself. A more gentle experience can be gained from baking a piece of fish al cartoccio with some fresh basil leaves, a good squeeze of lemon juice, along with some grated zest, seasoning and a generous drizzle of olive oil. A white fish such as cod or haddock works well because the mild flavour of the meat allows the basil to showcase its attractions. 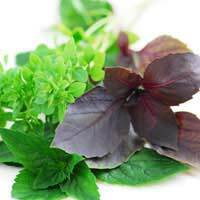 In common with other herbs, dried basil is widely available. It can work well in tomato-based pasta sauces but otherwise is no match for fresh. If you are intending to grow the herb in your garden or allotment, or even propagate it on your window sill, be sure to buy the Sweet Basil seeds rather than the Holy or Purple varieties as it is the former that is utilised in the Italian kitchen.